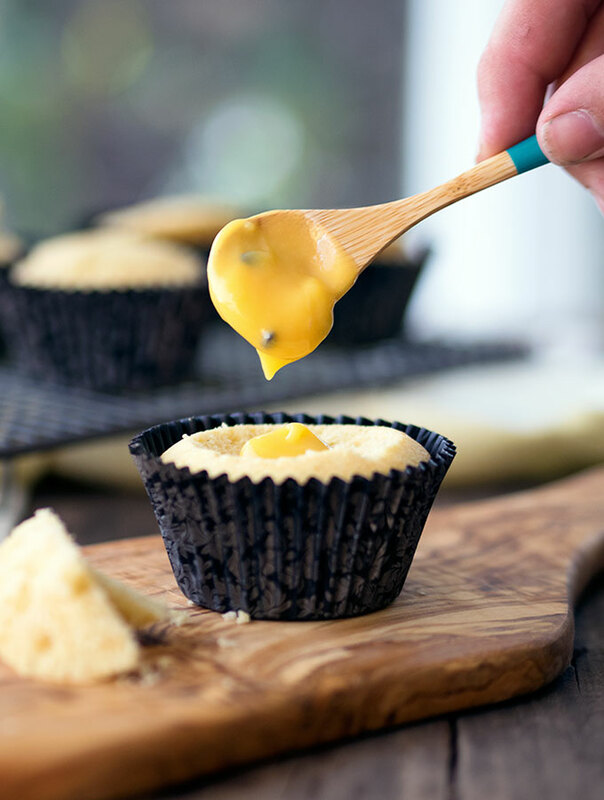 Life should be easy, and my passionfruit curd fairy cakes are the perfect example of that. 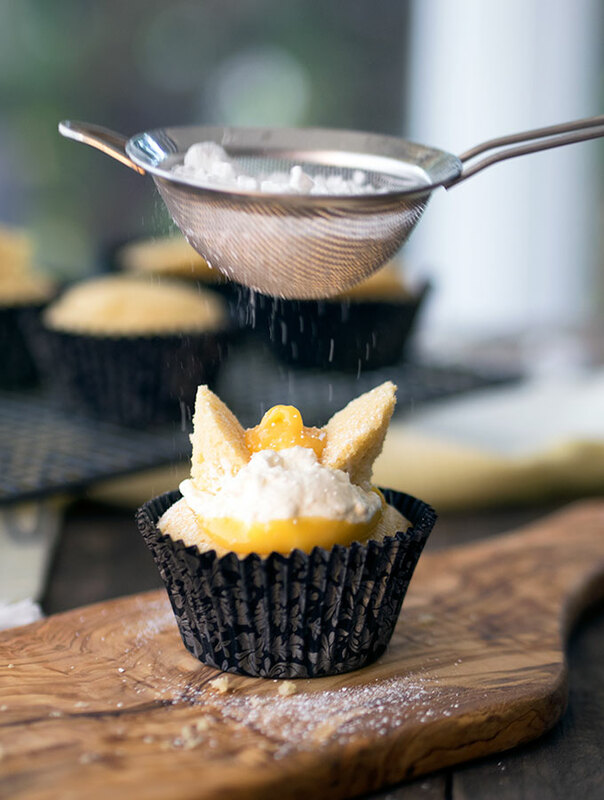 These fairy cakes were made from the mouth-watering passionfruit curd I shared with you a little while back. 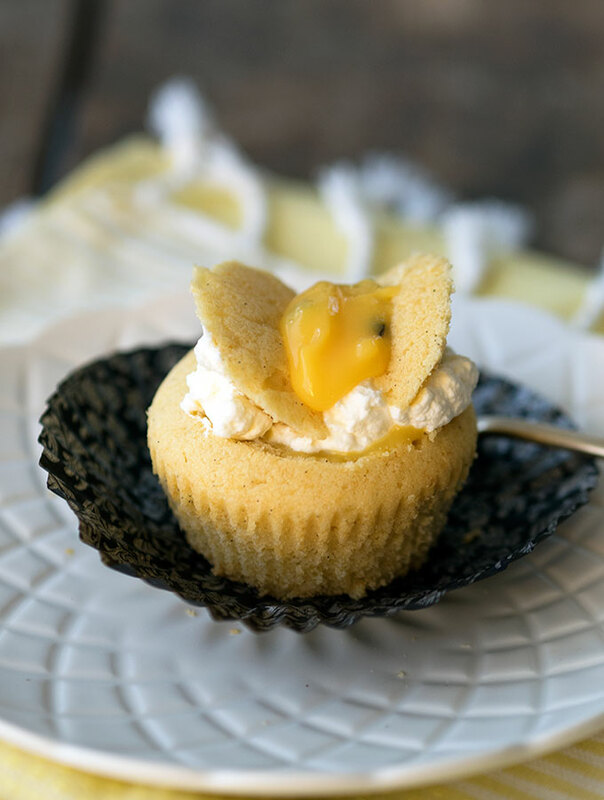 These passionfruit curd fairy cakes are pretty, fool proof and safe to make. I adore how they taste. There is the tang of the passionfruit curd accompanied with fresh cream and light as air cup cakes. A winning combination. Of course if you don’t have any passionfruit curd lurking around in your fridge, you could use strawberry jam, lemon curd, or even Nutella. You can find the recipe for the passionfruit curd here. The cup cake recipe is the same one that I used for my iced side down cup cakes, and you can find it here. 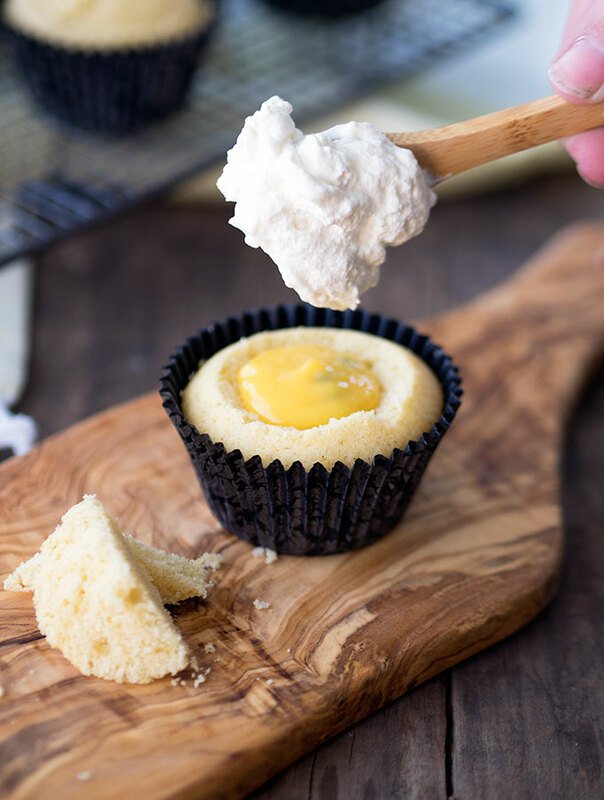 Then to make your passionfruit curd fairy cakes it is as simple as cutting a whole in the top, filling the cakes with cream and curd. Then cut the piece you cut from the top in half, and pop it back on top of the filling. A simple dust of icing sugar to pretty them all up. Become a subscriber and don’t miss a single delicious recipe, restaurant review or travel adventure. Plus you will also receive extra content and benefits. Sea urchin foraging sounds like a fab idea, if you ask me. Sign me up! Perhaps we can hit the road with a stash of these cakes in the boot! If only I knew now what I do about sea urchins back then, sigh. I love fairy cakes – but haven’t had them in years. Your use of the passionfruit curd in this is lovely! can just imagine how wonderful they tasted. Thanks Amanda, they were truly scrumptious. Sara is passionate about food, travel & photography. Belly Rumbles is her platform to share her passion. © Sara McCleary and Belly Rumbles® 2018. Unauthorized use and/or duplication of this material without express and written permission from this blog’s author and/or owner is strictly prohibited. Excerpts and links may be used, provided that full and clear credit is given to Sara McCleary and Belly Rumbles with appropriate and specific direction to the original content.